Agustí has just been promoted to a Research Director position, ending a 5 year stretch as a “Ramón y Cajal” fellow. Pictured below is a happy Agustí with the evaluation committee. November 5th 2018: welcome Rubén! We have a new recruit! Rubén Álvarez joins the group to carry out his Ph. D. thesis on the development of synthetic receptors for bioinspired catalysis. Ruben holds B. Sc. and M. Sc. degrees from University of Barcelona. Best of luck Rubén! Our proposal for the study of synthetic receptors with molecular dynamics (MD) simulations as been approved by the Spanish Supercomputing Network (RES)! Starting today we expand our frontiers into this new area thanks to the 192k supercomputing hours awarded (QCM-2018-3-0036). We’ll, it’s been a while since the last post! Some new recruits will be joining soon (stay tuned), but in the meanwhile Ricard was awarded a fellowship from the Ministry of Education. Congratulations! Also, check the awesome cover from Albert highlighting our work on fullerene functionalization. Albert’s work on catalytic functionalization of C60 fullerene has just been published in Chem. Eur. J. This research is a team effort with Dr. Anna Roglans and Dr. Miquel Solà in the DiMoCat group. Check it out! 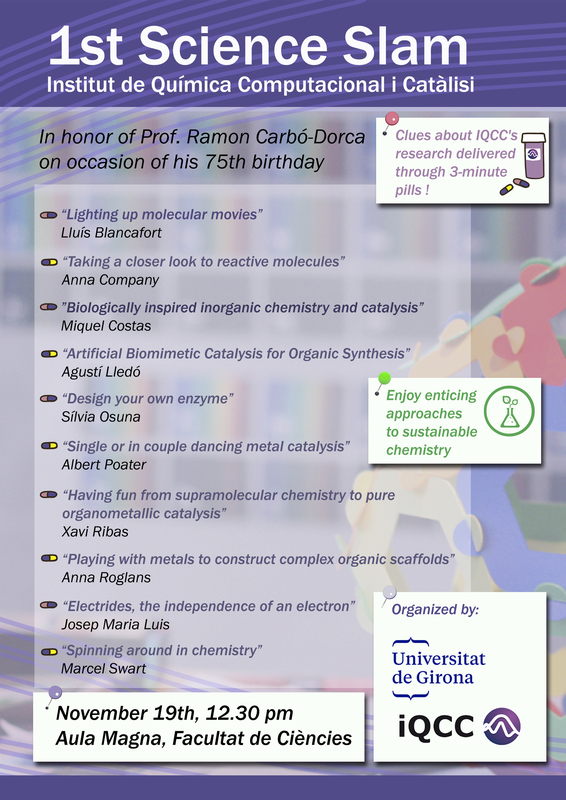 This week we celebrated the 2018 Girona Seminar in predictive catalysis. It has been an amazing week of lectures with the participation of many world renowned figures, including the 2016 Nobel Prize awardee Ben Feringa. Looking forward to 2020 for the next Girona Seminar! March 25th 2018: Paper accepted! Our collaboration with the group of Prof. Miquel Costas on the development of supramolecular receptors for bioinspired oxidation has produced the first results. Check out the publication in ACS Catalysis. December 26th 2017: Grant awarded! We have just been awarded a grant from MINECO (Spanish Govt.) to carry out supramolecular biomimetic chemistry for the next 3 years! Happy days! March 20th 2017: Paper accepted in Org. Chem. Front! Our latest work with functionalized cavitands has just been accepted for publication in Organic Chemistry Frontiers. The article is open access, check it out! A grant is available to carry out an MSc research project within the MACMoM program (Master in Advanced Catalysis and Molecular Modelling). More info here. If you are willing to pursue a PhD in the exciting field of organic supramolecular chemistry, we are looking for a talented candidate to apply to the FI scholarship program (Application deadline Sept. 22nd). Info here. April 21st 2016: Lledó and Lledós! The Girona Seminar came to the end yesterday with the gala dinner at Casa Marieta. Afterwards we grabbed some beers and I took this picture with my doppleganger Agustí LledóS, physical chemistry professor at the UaB! April 18th 2016: New IQCC website! The new website of IQCC has been presented by our director Marcel Swart during the opening of the 2016 Girona Seminar this morning. Please have a look at it here. Today I participated in the 1st IQCC Science Slam, an outreach event to promote the Institute research among the students and the UdG community. It was an intense morning with TED-like 3 minute capsules. 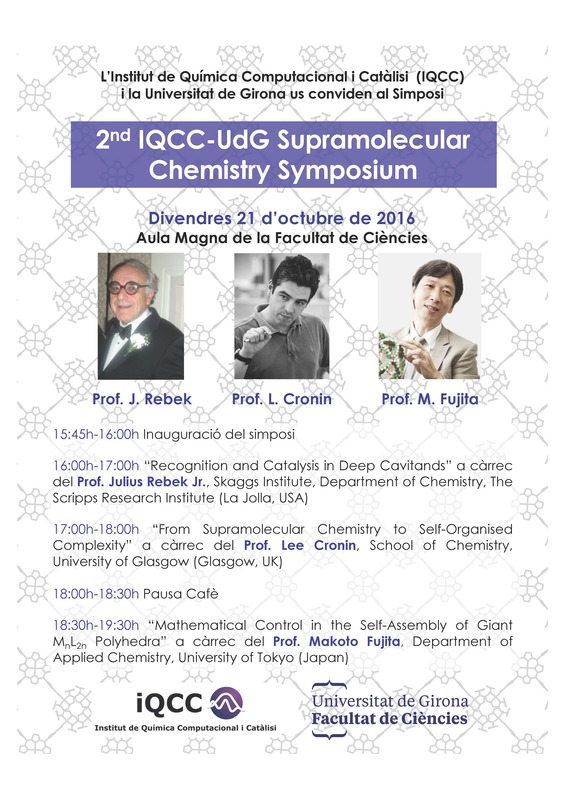 Today I traveled south to Tarragona to attend a mono-graphic symposium on photochemistry organized by ICIQ, “Lights on Chemistry“. The list of speakers is impressive, including most of the key players in the field of synthetic photochemistry nowadays. My recent communication to Organic Letters has been just uploaded on the OL website. This paper represents my first step towards establishing a successful independent research line on supramolecular chemistry. Together with the recent acceptance of another OL paper on transition metal catalysis it makes for a fruitful summer! June 23rd 2015: CaNaDARC project gets funded! The proposal has been selected for funding through the EXPLORA program by the Spanish Government (CTQ2014-61629-EXP). EXPLORA seeks to promote audacity in new research avenues or methodologies and is de facto a high risk – high reward scheme. I have been granted 45,000€ (+overheads) which will allow me to start a new research line on the development of new methodology for the bottom-up synthesis of carbon nanotubes and related structures. 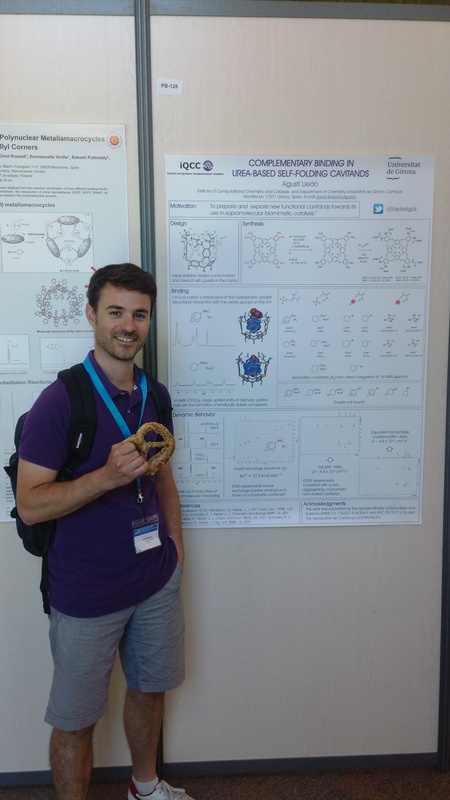 From June 28th to July 2nd I attended the 10th International Symosium on Macrocyclic and Supramolecular Chemistry, held in Strasbourg. It was an intense week of lecturing and networking while coping with the heat wave that spread over southern Europe. Other members of IQCC were also present (Cristina Garcia from QBIS group gave a great lecture) and I had time to catch up with old friends.